Randomness shapes events of life on the microscopic and macroscopic level. Though, scientific disciplines struggle to find effective ways of teaching randomness. Modern and alternative approaches that train students to think of random events could pave the way for a new generation of scientists and of human progress. Events of life are constantly influenced by randomness. According to the Oxford English Dictionary, randomness can be defined as “the quality or state of lacking a pattern or principle of organization”. While it is true that most models of nature are built according to physical and mathematical rules that are in agreement with observed events, they are often simplifications of the real underlying process, which is usually influenced by subtle random events. Indeed, visible and predictable events are usually composed of a series of unpredictable random circumstances. However, simplification is an important concept, functioning as a mental procedure for understanding and processing information. In every scientific discipline this mental procedure is fundamental in obtaining basic knowledge, paving the way for allowing the comprehension of more difficult concepts. It does, however, also come with a loss of details. For instance, biology is often taught through representative schemes and pictures, which are simplifications of real situations. One of the most interesting examples is the interaction between an enzyme and its substrate. Usually this interaction is explained using a puzzle-like system in which the enzyme perfectly binds to the complementary shape of the substrate (Figure 1). Figure 1 – Classical textbook illustration showing the interaction between an enzyme and its substrate. The picture represents an easy and mostly correct way to teach this particular biochemical event, and our strong ability to process visual information allows for this concept to be easily encoded into our long-term memory. It is however a simplification, which necessarily implies the existence of a real – yet more complex – situation. It is a concept that is often encountered; in order to make complex concepts more tangible people often attempt to simplify molecular or astronomical events by picturing them as if they were occurring on a dimensional scale that we can comprehend. Following this line of thought, Figure 1 seems to indicate that the enzyme is magnetically attracted to the complementary substrate, which is not true. Indeed, inside the cytoplasm – the material within a living cell –, proteins are shuttling around and only by chance hit their partners. This means that these biological events are actually probabilistic in nature, and that randomness is their driving force. Another interesting example is provided by the concept of biological evolution, which is often misunderstood by students. The most common way to teach evolution starts from a historical perspective that provides an overview of the scientific theories that precede the theory of Darwin. 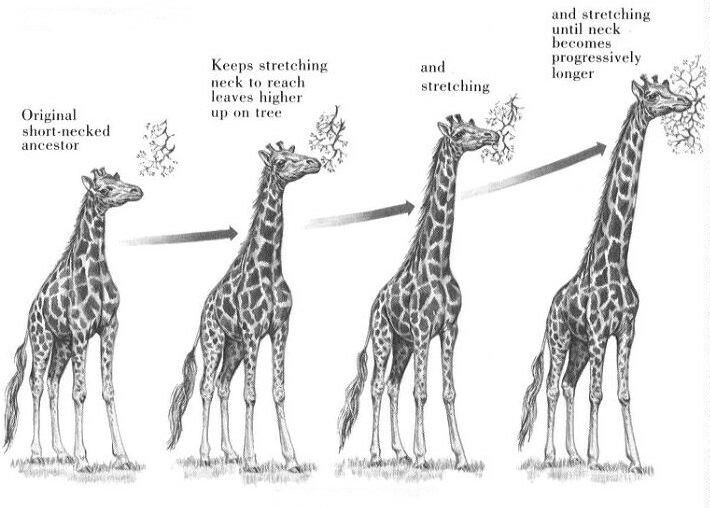 The theory of Lamarck (1), which is the second most popular after the Darwinian theory, states that evolution works as a force that drives a change: giraffes with a short neck are encouraged to eat leaves from high plants and therefore they need to slowly elongate their neck length in order to survive. Lamarck also adds the idea that these traits are inherited, even though it is well-known that traumatic events, such as the loss of a finger, are not inherited. Instead, Charles Darwin revealed the scientific truth by clarifying that evolution is dependent on random modification of the traits that can be positively or negatively selected by nature (2). According to Darwin, giraffes with a short neck are destined to die, while giraffes with a long neck are destined to reproduce themselves. Therefore, the genius of Darwin emerges with its shocking definition of evolution as a random process. The example of the giraffes is a favourite of many professors around the globe because, as already explained, it is a simplification that guarantees the easy and immediate comprehension of a complex concept by the students. However, the concept of randomness is not intuitively comprehensible. This means that its crucial role in the aforementioned giraffe example is often not as deeply embedded into our memories, leading students to be confused between the theory of Lamarck and the theory of Darwin. From the perspective of a student, the giraffe example underlines the idea that evolution acts by stimulating innovations, although this is not true. This happens because graphical representations are easily impressed in our long-term memory, whereas concepts that include randomness require a sustained and repeated mnemonic stimulation to get to the same result. These two examples serve to illustrate that schemes, graphical representations and simplified models, albeit necessary, are not sufficient for the comprehension of biological – and in general of scientific – concepts. Randomness is also of importance when we think of how individual human relations, which are themselves shaped and modelled by unforeseen micro- or macro-events, give rise to often unpredictable and intricate behavioural patterns within and between different human groups (3). Theories of international relations (IR), for instance, struggle with the notion of randomness. There is indeed, in the field, a general belief that randomness identifies unstructured realities: if there is no predictability there is no science, whereas predictability means that a scientific approach can be applied to uncover the mysteries of the process under study (4). Challenging this idea will probably push forward – through a constructivist discourse – the field of IR: random events can be scientifically studied, and biology, although with some practical limitations, could lead the way. Teaching randomness at school in addition to the existing basics could therefore help the next generation of scientists to develop ideas that are not tied to inaccurate and simplified knowledge, which could be a valuable advantage. Lamarck, J.B., Philosophie zoologique, 1809. Darwin, C., On the origin of species, 1859. Kavalski, E., “The fifth debate and the emergence of complex international relations theory: notes on the application of complexity theory to the study of international life”, Cambridge Review of International Affairs, 2007. Giddens, A., “Central problems in social theory: action, structure and contradiction in social analysis.” University of California Press, 1979. Why is it so critical to understand how randomness shapes our reality?